San Clemente is a town on California's Pacific Coast that became very familiar to Americans as the vacation home of former President Richard Nixon. Many people still have images of the fabulous beaches that fronted the Nixon mansion. Surfing is top-rated in this area. His mansion became known as the Western White House. San Clemente is a beautiful town in Orange County south of Laguna Beach and Los Angeles, halfway between there and San Diego. The sea gives way quickly to the dry mountains of southern California. There are active adult communities in the area - check the links at left. According to Zillow.com the median home value in San Clemente was about $962,200 in early 2019. 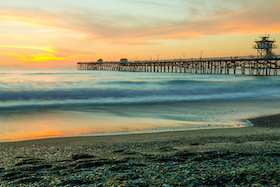 San Clemente is one of America's top surfing spots. It has a nice downtown, beautiful beaches, great scenery, and fantastic weather. Old City Plaza is a historical downtown site with shopping and dining. Many historic meetings were held at the Western White House. One of the entrances to the large Marine base, Camp Pendleton, is here. Surfing is very popular in San Clemente and is considered a major destination for surfers from around the world; San Clemente's city slogan is "Spanish Village by Sea" ; The San Clemente Ocean Festival and San Clemente Sea Fest are both annual summer events. Crime in San Clemente is about a third of the national average, which makes it a relatively safe community. San Clemente Hospital and Medical Center is here.